I love green salsa. And what I loved about New Mexico– when I was there, maybe 5 years ago? with my friend Justin– was that they have green salsa everywhere- to put on anything. So feel free to use this on anything- with chips, fish tacos etc. 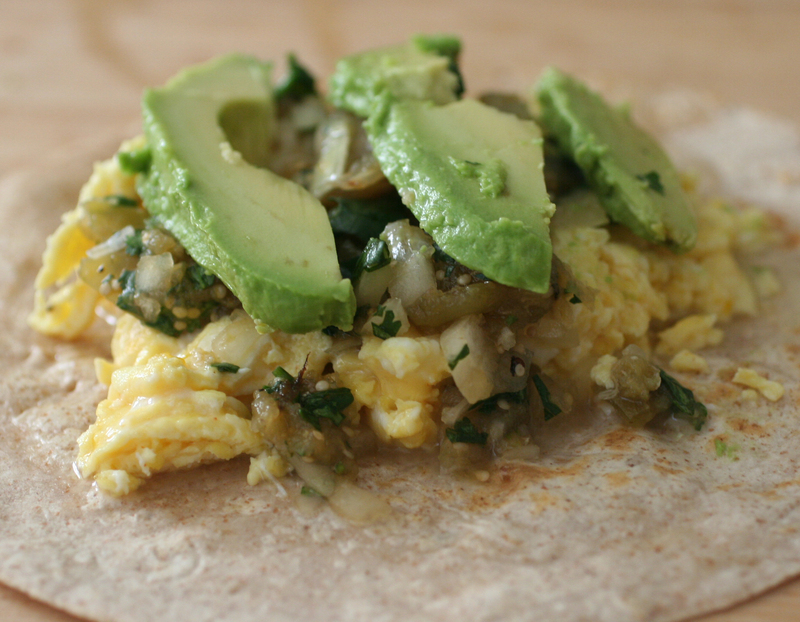 But what I especially love it with is eggs, breakfast burritos etc. Man oh man. So, when I saw this recipe in Alice Water’s cookbook in Chrissy’s apartment- I expressed to her what good use the book would get in my kitchen– and she let me borrow it on extended loan 🙂 In this book- Green Kitchen- Alice has all her friends give very simple recipes. This recipe– is in a whole section about how awesome a mortar and pestle is– and i’m sure it is- but i don’t have one. So instead, I basically took my clean plastic cutting board and a slotted spoon and continually mashed everything together on that- incorporating the tomatillos one at a time. This recipe can also be done w. tomatoes- as red roasted salsa- which i’m sure would also be delicious. I am generally reticent about adding cilantro or parsley- because I am not so into it- and I always end up buying a big bunch, using a little and the rest going to waste. But, as I had some cilantro already- I added it in- and I would say yes, it really does make a difference- so you should spend the extra 87 cents (price at the co-op) and get it. Also, my salsa definitely had a little too much onion. I had never heard this before- but it suggests you rinse the raw onion under cold water to get out some of the bitterness. Next time, I think I would start out w. maybe a 1/4 cup of chopped onion– and then add more from there– to taste. I suppose maybe I used more of a medium than a small onion? And since I had so much onion and heat from the jalapeno- I think I used an extra lime– again, start w. 1 lime and add more to taste. Heat a cast iron pan over med-high heat (I dont have a cast iron so used a stainless steel skillet). Put whole chile and unpeeled garlic in pan. Remove tusks from tomatillos and cut in half. Cook 10 minutes until they are softened and browned. Turn over to brown other side- about another 10 mins. Squeeze garlic out of skin. Remove stem from chile and cut. Grind chile and and garlic w. a motar and pestle– or as i did, grind it into cutting board w. back of a spoon. Add tomatillos and mash. I did this- incorporating them one at a time (they are so cooked they break down pretty easily). Peel and dice onion. Stir in. Squeeze lime and add cilantro. May need a little water to thin out (mine didn’t need). Salt liberally to taste. Good served w. avocado. If you are left, as I was, with a lots of burnt stuff on your pan- check out Just the Tips #7- for a quick clean up trick. Anonymous feels kinship with green salsa, since it, too, is often anonymous in restaurants (except New Mexico where Justin used to live).